Ask fellow campers about "Edisto Beach State Park" and nearby attractions. We stayed at the Live Oak section of the Edisto Island State Park, site #95. This section is not beach side, but is only a quick drive to the beach. As a camper, I believe you can park at the beach front section at no extra charge (you'll want to call and confirm that, but we were not charged). The park is okay, but it doesn't appear to be maintained very well. The sites are shady and somewhat private, but they are also overgrown. Our site had piles of brush towards the back of the lot that gave it an "uncared for" look, but there wasn't any leftover trash and the fire ring had been cleaned out. There are no paved parking pads, so everything is incredibly sandy, which is to be expected given the location. Our site was also extremely close to the main road and traffic noise could be heard constantly. We'll definitely go back, but we'll choose another site that is further away from that area. We camped at Edisto Beach State Park in a Travel Trailer. Coot's Bar & Grill is the only restaurant directly on the beach with a small seating area outside. Drinks were affordable and the shrimp basket is very tasty. We stayed in the Beach section of the park, after originally being scheduled for the Live Oak section. Most of our review will be concerning the Beach section. We were able to check in early, and they have a parking spot at the check-in location for early-arrivers like us. The campground is very near the beach, which was for us a big plus. Seashells are abundant along the beach. The bathrooms were clean for the most part. I found the wifi signal relatively strong near the bathhouses, but not reliable in the camping area. Plenty of Cell and Data Signal on T-Mobile. No playground in the park; apparently it was a casualty of one of the recent hurricanes. Our site (23) was very near to the beach, so close that we could hear the waves. There was not much space between sites or shade, and I imagine it would be very buggy during the summer. The water and electric seems to have been recently upgraded and were well-placed and nice. 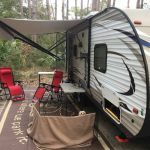 We camped at Edisto Beach State Park in a Travel Trailer. McConkey's Jungle Shack is a local spot with fabulous food and a welcoming atmosphere--located right behind Bi-Lo. We wanted to come to the beach and this location was ideal for overnight stay. The sites are varied with water and electric available. We requested a beachsite and we just follow the trail around the dunes and were able to enjoy the miles of beach there. We were also amazed by the large quantity of seashells on the beach. We are no longer collectors but certainly could be a collectors paradise. The bathrooms and showers are up-to-date and clean. There are outside showers as well to rinse the sand off. We were surprised by the expense for a state park. It is definitely high. There is a grocery store, liquor store, restaurant and more within walking distance of the park. No park laundry facilities. Cable is included and works well. Wi-Fi is also included and seem to work fine for us. There is a dump station. 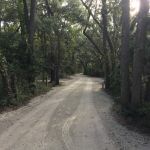 We camped at Edisto Beach State Park in a Travel Trailer. This was our 3rd visit to Edisto Beach State Park, and unfortunately, our most disappointing. In the past, we've had a front window ocean view from our motorhome on the few sites that face the beach. This time, apparently the storms that destroyed the beach loop sites necessitating a rebuild, also left the sand dune along the beach much higher than previously, so the only view was of the backside of it. Other than that, our visit was pleasant and quiet, and the walk to the nearby beach access was short. The rebuilt sites have been upgraded to 50/30/20 amp electric, but I noticed the price has now also been increased to $58/night. Our site, #18, was level packed sand, and the water and electric connections were centrally located on the site for an easy hookup. We didn't use the water though, since it has a very salty taste to it as the park information noted. We came in with a full fresh tank that easily lasted for our four night stay. The town of Edisto Beach is just across the road from the park entrance, and has a small Bi-Lo food market that's well stocked, although with a limited brand choice. There several restaurants nearby, and as others have mentioned, the Sea Cow is must visit, especially for breakfast. Our AT&T and Verizon phones and Internet hotspots worked well here, and our site had a wide open satellite view. The park offers WiFi at the office for those that need it. We camped at Edisto Beach State Park in a Motorhome. This park is essentially two separate CGs. The "Beach" CG are sites 1-75. Sites 1-12 are in low clearance areas and I would be reluctant to go in with anything over 10' in height. Take that with a grain to pound of salt. These sites also have full shade. The roads are paved and sand and easy to maneuver on with the exception of 1-12. Check the length of the site on Res. America. They all have 30 amp service and water. Note the water is rather salty but potable both CG's. All the sites I saw looked pretty flat and packed sand. There's a few sites that are out in the open with no shade on the north end all the rest have at least a smattering to full shade. The showers are heated and clean. I did not use the facilities at this site. The beach is just a short walk over the dune. The "Live Oak" CG is off the beach on Edisto Island about ¾ mi. It has sites 76-125 for rv/tent and sites 126-130 are walk in tent sites all with nice views. It is in a Live Oak Maritime Forest along the marshlands tidal areas. The roads are sand and are a bit tight but doable. All the sites are very flat with 30 amp, water with packed sand and most are just a straight shot back in. We were in 122 and had to do a lot of maneuvering to get in. Most of the sites are heavily shaded and have a lot of space between sites. There are several very nice hiking/biking trails that run through the forest and over the marshlands on very nice board walks. The showers were clean, heated (a huge plus when we were there) and had good pressure. The bathrooms were equally as clean. When ice is off the rivers this would have been a great place to paddle around in a SUP or kayak. When I booked 6 days it was about $30/day but I had to extend one day due to the storm and it was less than $25. I did it at the office. Down at the "Beach" they lock you in at night but probably give you a combo to get out. There's no gate at "Live Oak" CG. We'd stay here again if we're in the area. We camped at Edisto Beach State Park in a Motorhome. The hiking trails and views of the marshlands and forest in an ice storm and blizzard were magical.... for the 1st 2 days, then it was just cold. We stayed at the beach campground and had a magnificent experience. The park personnel are friendly and helpful, our site was large and level. We had a marsh-view site where it was beautiful to watch the tide rise and fall and birds swim and fish in the salt marsh just a few yards behind our motorhome. While there are no ocean view sites, beach access is easy via several walkways through the dunes. This is a pet-friendly park which was great for our three dogs. The only reasons I give a 9 rather than a 10 are that 1) The drinking water is somewhat salty. We had already read about this before arriving and just used water from our fresh-water tank for drinking. 2) Our site (and maybe a couple of others) was slightly flooded during a particularly high-tide. This was not a problem since the site is so large and we were able to move forward onto a dry portion after waking up our first morning to find our back wheels and picnic area under a couple of inches of water. The water receded that day, and never returned, allowing us a happy campfire the next night. We camped at Edisto Beach State Park in a Motorhome. We stayed in the Live Oaks campground as the beach campground is still closed from Hurricane Matthew. This is a small park and some of the sites are close together and some are like a double so friends can camp near each other. There are trails here, but only one is open due to the hurricane. The water in Edisto Beach is salty and is treated because of the excess salt. The town deems it safe to drink but the town also provides water that has gone through a reverse osmosis facility. This is available at the fire station downtown where you can get 5 gallons at a time. You have to bring your own container though as you can't hook up a hose to the spigot. The campground is about 1/2 mile from town. The town itself is pretty small but the beach is worth visiting. There is a decent Bi-Lo grocery store there, one gas station and a liquor store. We camped at Edisto Beach State Park in a Motorhome. Heavily wooded site with live oak trees, very pretty. Fairly private site. Water is salty and did not use. Beach portion of the park was destroyed by Hurricane Matthew. Expected to be rebuilt by September 2017. Site was flat but very fine sand. Trails were closed due to hurricane. The beach, small grocery store and restaurant were 1/2 mile away. We camped at Edisto Beach State Park in a Motorhome. Roads are not as bad as others have indicated - greatly improved in last year. Prices have gone up a lot in the past year but our site was merely yards away from the surf. Staff mostly helpful and friendly. We camped at Edisto Beach State Park in a Cabin. The BI-LO has most things needed and is within walking distance. Sea Cow a must on the island especially for breakfast. We also like the atmosphere at McConkey's Jungle Shack. First time to visit this park. We will definitely be back. Loved Edisto Beach and the park is beautiful. Lots of trees for privacy, sites are spacious with water & electric hookup. Ocean on one side and marsh in the other--beautiful sunset over the marsh and sunrise over the ocean. Beach was nice, with piles of shells. Rangers were very helpful during check-in. People were very friendly--lots of families. Dogs are allowed on the beach, which is great. This is now one of our favorite parks. 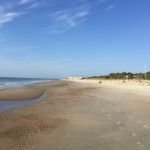 We camped at Edisto Beach State Park in a Travel Trailer. Had pizza & wings at Loretta's. It was really good. Large shop next door with great selection of clothing, etc. We stayed in the Beach campground which is a narrow spit of land with campsites on it. Our site was on the "creek" side, so we saw the tides come in and recede feet from our front door. It was a great spot for nature watching! We did have a racoon visit our site each evening, so put your food away! The beach is a very, short walk away, and it is absolutely beautiful. Many, many shells on the sand. The campsite was a bit tight for our 30 foot rig. We only attached to electricity, having heeded other reviewers warnings about the water. We really liked this campground. Go to the Nature Center and take the hike to the Coastal Marker from 1850. The signage along the path and the marker itself were fascinating. We camped at Edisto Beach State Park in a Motorhome. Botany Bay Plantation Wildlife Management Area is a few miles away and is a really nice nature drive (does not take RVs) and has a good kayak put-in. Bi-Lo grocery is across the street from the Beach campground. 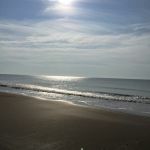 The beach loop at Edisto offers a great view of the ocean from some sites, especially the ones right along the beach. The view out our front window was fantastic, and the beach access was only about 100' from our site. The winds are fairly constant, so keep that in mind when deploying awnings, etc. The sites are sand and sparse grass, typical of seashore most sites. The park work campers are constantly attending to sites as they become empty, cleaning out fire pits and raking the sand. The hookups are conveniently located, although hooking up to the water may not be a good idea. The water is fairly salty, although the town does treat it to make sure it's safe. There's a good water supply point nearby in town, where you can draw up to 5 gallons per day, or make sure you bring a good supply with you. The 30 amp electric at 120 volts was very stable. Our Verizon voice and data service was strong, and our open site made getting a satellite signal easy. The OTA TV signals from Charleston were also quite strong. We very much plan a return visit here in the future. We camped at Edisto Beach State Park in a Motorhome. There are several nice restaurants in town, and the Sea Cow Eatery serves an excellent breakfast. Grocery shopping is limited to a small Bi-Lo market and a couple of gas station convenience stores, so come prepared. This is probably our sixth visit to Edisto and was not the best. We got there after a big storm but it took them a couple of days to get some of the roads patched with gravel (piles of gravel were already there). The site we were in (54) was not level. It wouldn't take much to level the site out. Normally they have volunteers who clean the campsites up when people leave (we're paying $50/night and they still rely on volunteers? ), and they do a great job. When there are no volunteers, the campsites are not cleaned as we found out. Someone in the site across from us departed and left a bag of trash and a bunch of other stuff in the fire pit (you have to pass the trash containers on the way out), so since there were no volunteers, the trash sat there for 2 days and when the next occupant got to the site they told the rangers and they sent someone to clean it up. Why can't the ranger or any of the workers that passed the site daily pick it up? They installed wi-fi at the 2 bathrooms. The only problem is that they have a very limited range (like right around the bathroom). This is a great idea, but they need a more powerful transmitter/receiver. Hopefully the next trip in the spring will be better. We camped at Edisto Beach State Park in a Motorhome. Bi-lo supermarket across from the park entrance as well as several restaurants. A fish market a couple of miles away with daily fresh fish. There are two campgrounds, one in the woods and one at the beach. For us it is all about the beach, however, we do enjoy staying with friends at the woods campground. Many have ample shading and we always have a great time here. The bad is the beach campground road. Terrible. Needs packed gravel not more dirt. 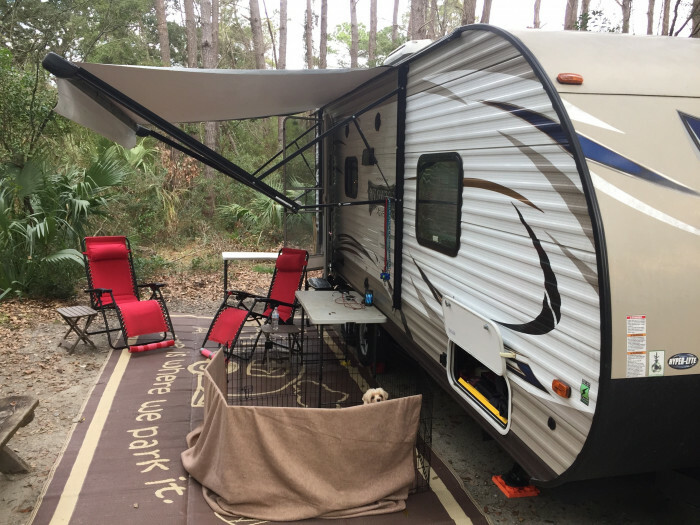 We camped at Edisto Beach State Park in a Travel Trailer. A few cute shops and restaurants on Edisto, Charleston is about 45 minutes away. Do not drink the water, it is salty and will ruin your morning coffee. We always got to Edisto w a full tank of fresh water. There is one location that I understand you can get fresh water. Make sure you take containers to carry water in. We try to bring everything we need with us, however, the Bi Lo is very convenient, right across from the campground. A few cute shops and restaurants on Edisto, Charleston is about 45 minutes away. Do not drink the water, it is salty and will ruin your morning coffee. We always got to Edisto w a full tank of fresh water. There is one location that I understand you can get fresh water. Make sure you take containers to carry water in. We try to bring everything we need with us, however, the Bi Lo is very convenient, right across from the campground. The Sea Cow Eatery is a quaint little restaurant that seems to be popular with the locals. Breakfast there was particularly good, if a bit pricey. The Bi-Lo market carries a good line of typical grocery and household products, and the prices are quite reasonable for the most part, considering the nearly captive market they serve. Local shops for area clothing, restaurant bars if you're not into cooking out at your site under the stars are within walking distance, no corporate shops in site (and that's great)! Get up early for one of the best sunrises you've seen and a lot of sea shells. Grocery shopping on the island is limited to one store, BiLo. There is a Bilo grocery store nearby and a pizza place called Bucks with awesome pizza! Are you affiliated with Edisto Beach State Park ?